Returns the opposite vertex to the halfedge _heh in the face referenced by _heh returns InvalidVertexHandle if the _heh is boundary. Returns the opposite vertex to the opposite halfedge of _heh in the face referenced by it returns InvalidVertexHandle if the opposite halfedge is boundary. Check whether flipping _eh is topologically correct. Adjust outgoing halfedge handle for vertices, so that it is a boundary halfedge whenever possible. Find halfedge from _vh0 to _vh1. Returns invalid handle if not found. Const end iterator for vertices. Const end iterator for halfedges. Const end iterator for edges. Const end iterator for faces. Add a face with arbitrary valence to the triangle mesh. 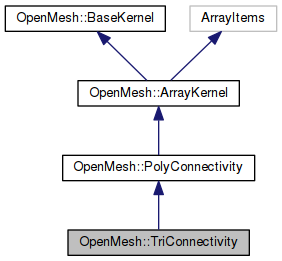 Override OpenMesh::Mesh::PolyMeshT::add_face(). Faces that aren't triangles will be triangulated and added. In this case an invalid face handle will be returned. This function adds a triangle to the mesh. The triangle is passed directly to the underlying PolyConnectivity as we don't explicitly need to triangulate something. Check for topological correctness first using is_flip_ok(). Returns whether collapsing halfedge _heh is ok or would lead to topological inconsistencies. This method need the Attributes::Status attribute and changes the tagged bit. The properties of the new edges, halfedges, and faces will be undefined!